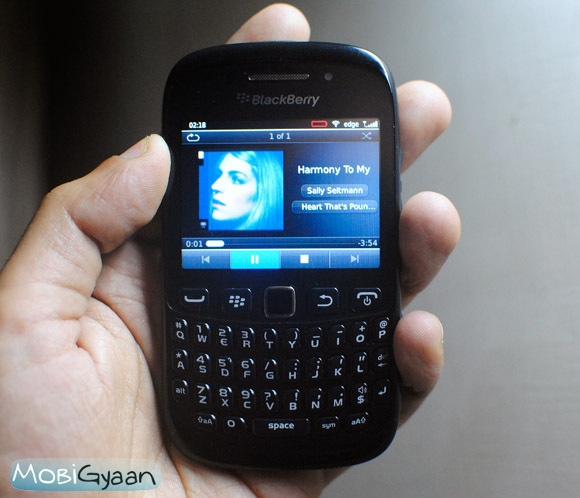 RIM has been making some decent amount of money in the Indian market by focussing on the youth segment and all thanks to its BlackBerry Messenger service. However, the company hasn’t been doing well on a global scale. With the new BB OS 10 on the way, the company should be really focussing on adapting new strategies which should include a variety of devices in different price segments. 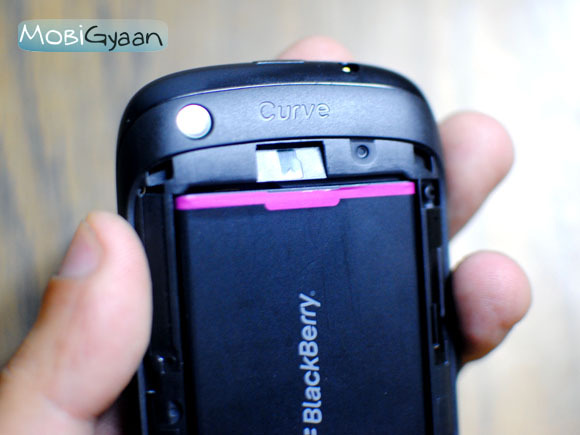 Speaking of which, we have the newest Curve 9220 with us. The device does seem to be an upgrade of the Curve 8520 and is priced at Rs. 10,990 which seems a decent amount for a BlackBerry device. But is the device worth the price and is it a worthy successor of the 8520? Let’s find out. The device comes with standard set of accessories including a pair of headphones, a wall charger with a USB port and a microUSB data cable. 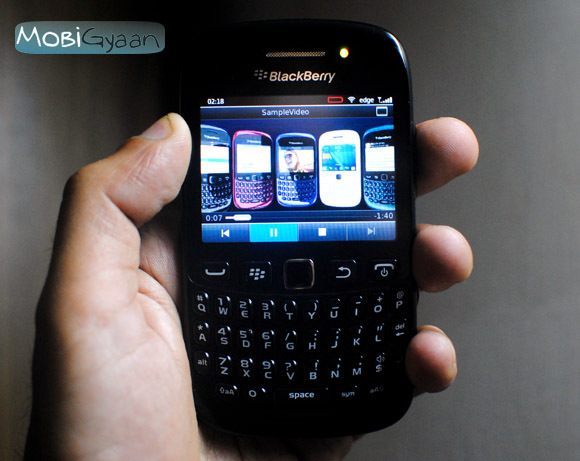 The design isn’t very different from the usual BlackBerry design, however there are improvements. 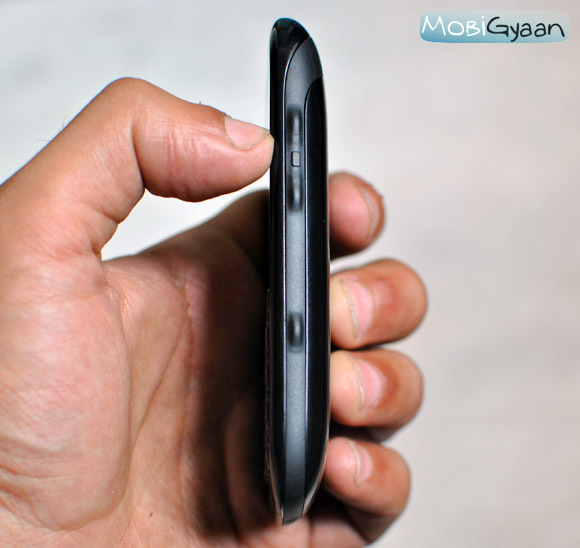 It is slightly slimmer and lighter than the Curve 8520. The QWERTY keyboard is pretty easy to use and the trackpad helps to navigate better. The device is all plascticy but doesn’t feel cheap in the hand. The 2.4 inch display is pretty bright and is decent even under the sun. RIM has ditched the dedicated music keys and now there is the lock/unlock key at the top along with the 3.5mm audio jack. The right side has the volume keys and the camera key. 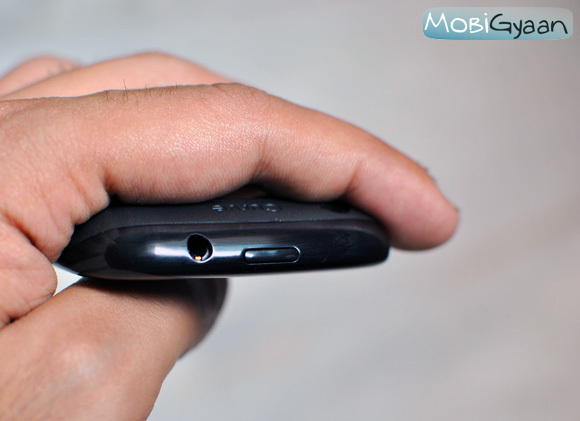 The left side has the microUSB port and a special BBM key which opens up the BlackBerry Messenger, quite convenient for the one addicted to the messenger service. The bottom part has the speaker which has a pretty decent output. 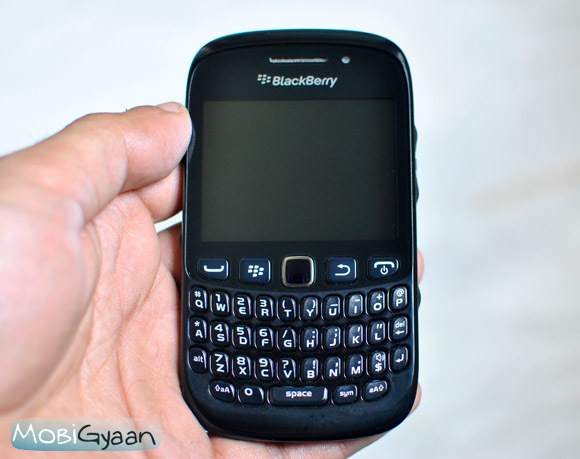 The back has the 2MP camera and the large chromed up BlackBerry logo. 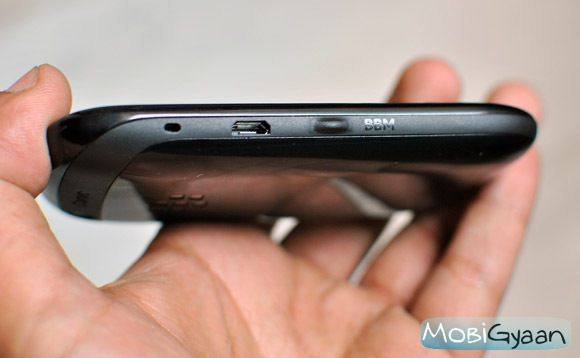 Inside you will find the 1450mAh battery, and slots for the microSD card and your standard sized SIM. The battery is a nice good bump as it gives a pretty good backup even if you keep tapping on that keyboard all day. I haven’t used a BlackBerry for a long time, but ill agree the new OS is not all that bad. Of course apart for the whole two minutes of bootup and the frequent hanging of the apps and the UI, it is pretty simple to use and everything is right there in front of you. You can easily manage your network connections, your sound profiles, notifications, and all your apps right on the main homescreen (if that’s what they call it). Once you are past the setup, the device is good to go and you can personalize the device according to your liking like the app drawer, wallpapers, themes, etc. Overall, there have been improvements on the OS as the device is pretty stable and with 512MB of RAM, it didn’t give much of a trouble when juggling with apps. The handset has Wi-Fi but no 3G which is a bit of a bummer. It does work on EDGE which is good enough when you are on the move. 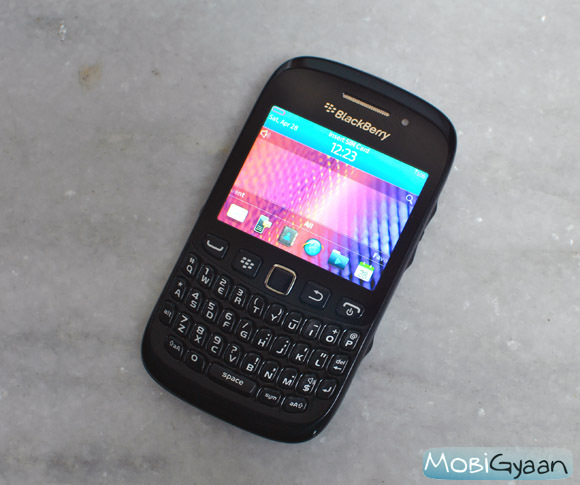 Although BlackBerry smartphones are not regarded as very good multimedia devices, but I guess the Curve 9220 being aimed at the youth segment, I tried out its potential in the department anyway. RIM has added the FM radio with the new Curve, which seems to be a decent addition as it adds value to the multimedia experience (atleast in India). The FM radio app is simple to use and the voice output is also very good. The music player is also good with basic functionality including repeat, shuffle and equalizer options and the options to control your music via the volume and the mute keys. The player supports all the basic audio formats including MP3, eAAC+, WMA, WAV and FLAC. The video player supports the basic MP4, H.263, H.264 and 3GP formats and the videos don’t look all that bad on the 2.4 inch display. The camera is not that appealing and it just manages to get decent shots that too in bright daylight. Even after having a 2MP resolution, the results are just ok. It’s the same story with video recording as the whole video is filled with a lot of noise. 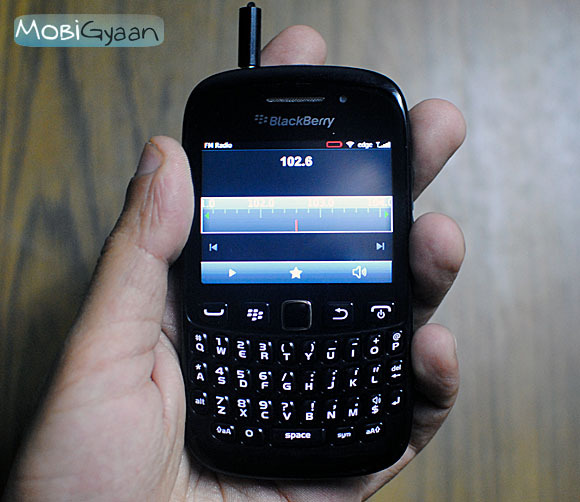 Besides the BlackBerry services and the social media apps, the device delivers good multimedia features and the addition of the FM radio is like a freebie. So, a decent price tag, all the basic necessities of a smartphone and the ability to make you a social butterfly. It’s a good bargain for the price, but frankly I am still not very satisfied with the OS. 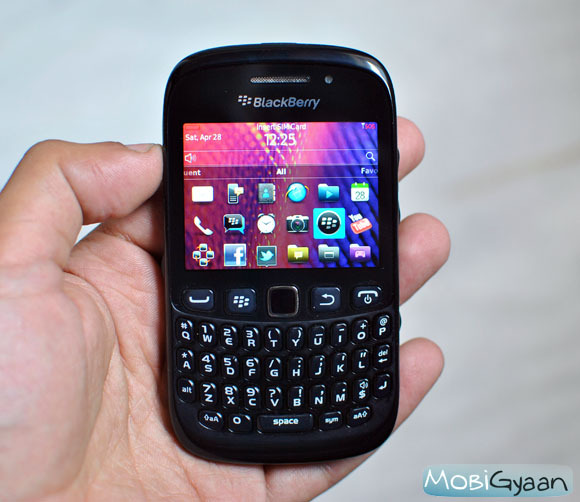 The new BB OS 10 should be cracker if RIM really wants to stay in the smartphone game.